MIAMI -- So, how do you guard Stephen Curry? That was the question posed to various members of the Miami Heat after they watched Curry torch AmericanAirlines Arena for 36 points, 12 assists and four steals -- the first player ever to amass those numbers in a game against the Heat. Most of the time, the answer to that question was simply this: a smile paired with a shake of the head. "Uhh ...," LeBron James said while grinning. "When you go against a guy who can shoot like that, you just hope that he misses." "It's tough, it's tough," Dwyane Wade said. "He's special." "Um ... not the way we did tonight," Shane Battier said. "That's for sure." "You can't defend that," Mario Chalmers said. AP Photo/Lynne Sladky Stephen Curry was running on all cylinders in the Warriors' win over the defending champs. "It's tough," Chris Bosh said. "Sometimes, he'd shoot it and sometimes he'd pass it. That's what makes him equally dangerous." Spoelstra was asked that Curry question a day before the game after the Heat's practice on Wednesday. His answer then? "Yeah, I don't know if anybody has figured that out yet," Spoelstra said. Did Spoelstra have a better idea after Thursday's game? "I mean ..." Spoelstra trailed off before giving out a chuckle. "What do you think?" No, the Heat didn't really have an answer for Curry on Thursday, which puts them on a list that includes just about every team in the league. Between threading the needle to David Lee in the pick-and-roll and splashing off-balance jumpers from impossible angles, Curry initiated almost everything for the Warriors, who crushed the Heat 123-114 for their league-leading seventh consecutive win. Curry is increasingly becoming one of the biggest problems in the NBA. How do you guard a guy who can make half his 3-pointers from just about anywhere in the half court? What happens when you complement that ludicrous shot-making ability with elite handle and playmaking skills? Well, you get jaw-dropping performances like Thursday's. After spending New Year's in Miami, Curry delivered some extra fireworks for a star-studded Miami audience that included names such as Julius Erving, Johnny Manziel, Guy Fieri and Jamie Foxx. In a game featuring a four-time MVP, it was Curry who routinely generated the incredulous "How do you guard that guy?" question. The Heat had a game plan. The Heat tried to execute their patented death-by-strangulation strategy against Curry, the same one that they famously used to stymie Jeremy Lin in New York during Linsanity and Derrick Rose in Chicago during the 2010-11 playoffs. But Curry was impervious. When the Heat trapped hard in the pick-and-roll, Curry more often than not maintained his composure and found the open guy. Usually that guy was Lee, who registered 32 points on 13-of-17 shooting and 14 rebounds of his own. In the end, five of Lee's 13 buckets came from a Curry dish. And when the Heat let up off the gas on their aggressive strategy in the second half, Curry went off. 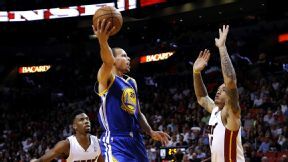 Attacking inside and out, Curry single-handedly outscored the Heat 10 to 8 in the opening six minutes of the third quarter, helping to break open a 14-point lead. Smother Curry and he'll split the defense and find teammates. Ease off and he'll unleash a soaring, back-breaking 3-pointer from the parking lot. "One of the best shooters that the NBA will ever see," James said after the game. "With the way he handles the ball, and the light he has ... It's more than green. It's fluorescent." James continued the Curry praise fest. "I looked at the stat sheet at one point and he was 7-for-13 from the 3-point line and I was 7-for-12 from the field," James said. "I was like, "Oh s---, he's got more 3s than I got field goal attempts." Curry shot 8-of-15 from downtown against the Heat, which ties the most makes and attempts the Heat have ever allowed from an individual player. And the thing is, he drained contested shots from just about every angle and distance. "It was incredible," Wade said. "A few times we were in his jersey and he made shots. We shoot those shots, those are bad shots on this team. Pull-up on the break, one-on-three, whatever. Those are bad shots over here, but those are great shots for him. And he made 'em." Really, is there a bad Stephen Curry shot in the book? "No, there's not," Lee said in the locker room. "He proved that again [on Thursday]. I know it seems like with the high level of difficulty that the shots are bad, but he's on balance the majority of the time. He rarely takes something out of the flow, and if he does, a lot of times it goes in, so we forgive him for it. He's an unbelievable shooter." Before the shooting inferno, Warriors coach Mark Jackson declared that Curry had "the green light" to shoot however many 3s he wants. Curry is now up to a career-high 8.1 3-point attempts per game and shooting 41.6 percent. With a conversion rate that high, why not keep firing them up? Battier, a student of the numbers, agrees with the "fluorescent" light that Curry gets from downtown since 3-pointers have 50 percent more value than 2-pointers. Effectively, he's shooting much higher than his raw field goal percentage indicates. "I agree," Battier said about Jackson's 3-point philosophy while glancing at Curry's line in the box score. "Eight of 15? Effectively, what's that, 80 percent? Why not? There's not a bad 3 for Steph Curry. It's math." Nights like Thursday is what should terrify the rest of the league. The Warriors entered the game with the third-most efficient defense in the land, thanks to Andrew Bogut and Andre Iguodala now being healthy. But they didn't play great defense on Thursday and still destroyed the two-time defending champs on their home floor. When Curry effectively punches in a cheat code and defies fundamental basketball principles with his dynamic abilities, the Warriors are virtually impossible to beat. To find the Heat unabashedly awe of an opposing player or team, it's a rare event. But Curry warranted that on Thursday. And with seven wins in a row, the Warriors, who sit at 21-13 and sixth in the West, are putting the league on notice. "They have a shot to come out of the Western Conference because of his ability to pass with both hands and shoot," Wade said. "That's a very good team over there. Mark Jackson has done a very good job, but Stephen Curry makes them special." Would Wade like to see Curry in the Finals? "I would love to," Wade said. "Because that would mean we're in the Finals." Maybe, just maybe the Heat would have an answer for Curry by then. MVP: The numbers -- 36 points, 12 assists, eight 3-pointers, four steals -- are incredible, but still don't do Stephen Curry's performance justice. Golden State's superstar went supernova in a surreal third quarter, scoring 14 points on an array of difficult jumpers that sucked the life out of Miami. X factor: Golden State's first-half turnover woes were matched by those of LeBron James all game long. The world's best player committed eight turnovers -- many of a confounding variety -- in a performance he'd no doubt love to forget. That was ... Golden State's "full squad": Amid doldrums of middling play spurred by injuries in late November and early December, the Warriors never panicked. Finally healthy with its full squad intact -- a team-wide talking point of late -- Golden State has won seven straight games for the first time since 2005. MVP: Deron Williams deep-sixed the Thunder with 29 points, including a season-high six 3-pointers. He also had five steals in his 41 minutes while outplaying Kevin Durant, and nailed a heave at the end of the third quarter to set up the comeback. Defining moment: 0.00 The clock read triple zero when Joe Johnsons buzzer-beater sailed over the outstretched arm of Serge Ibaka and splashed through the net for the win. It was Johnsons fourth game-winning shot at the buzzer since he joined the Nets. That was ... a heist: OKC was in cruise control most of the game, until a scoreless drought that lasted 5:35 of the fourth quarter. The Nets hung around and kept themselves in position to steal a potential season-changing win. MVP: In a season that's seen his psyche shattered, Iman Shumpert's 27-point performance might as well mark a turning point. He hit his open looks, played tenacious D, and came up with an absurd put-back off a Melo miss to seal it late. X factor: After something of a spotty start, Beno Udrih managed to connect on a number of run-staving buckets during a tenuous second half. His end line wasn't spectacular, but the little things made Udrih indispensable. That was... not according to script: The Knicks have made blowing games their own weird performance art all season. To hunker down and deal the needed death blow -- to one of the league's best, no less -- is the kind of thing that can turn a season around. MVP: Despite doing some serious assist-hunting in the game's closing minutes, Joakim Noah finished just sort of a triple-double. The Bulls center posted 17 points, 11 rebounds and nine assists though, showing off yet again why he's one of the most versatile big men in the NBA. X factor: Boston was sloppy with the ball all night, coughing up 20 turnovers on the evening, including six in the fourth quarter. The constant miscues helped Chicago to pull away late. That was ... some ugly shooting: Each team shot less than 42 percent from the field and both squads combined to make a mere 4-of-27 3-point field goals. MVP: Damian Lillard was unconscionably hot all game from every spot on the floor. The Dame made all his six 3-pointers and finished 9-for-13 overall for 24 points and seven assists. Defining moment: Opening tip. The Blazers came out firing on all cylinders. By the 5:00 mark of the first quarter, they were 6-for-6 from long range and had the Bobcats down 28-13. The game was over before it ever really began. That was ... hopelessly unstoppable: The Blazers were pouncing on every Bobcat mistake to the tune of 21 made 3-pointers. Charlotte played with energy and hustle all night. It was an exercise in futility, though. MVP: What a night for Anderson Varejao, who finished with 18 points and a career-high 25 rebounds. The most impressive thing about his performance wasn't his rebounding, but his ability to drill midrange jump shots each time a Magic defender dared him to. Defining moment: Trailing 78-68 with 1:34 left in the fourth quarter, the Cavaliers responded by going on a 11-1 run -- with some help from Orlando (see below) -- to tie things up at 79 apiece and force overtime. It was a shocking turn of events. That was ... a choke job: Up 79-73 with 13.9 seconds left, the following happened: Jameer Nelson fouled Jarrett Jacks 3-point attempt, Tobias Harris committed a five-second violation, and ETwaun Moore missed two free throws. That allowed Cleveland to tie the game at the end of regulation. Stephen Curry, Warriors: Miami had no answer for Curry, as he lit up South Beach for 36 points and 12 assists, including a 8-for-15 clip from 3-point range. Up by 11 heading into the fourth quarter, the Thunder couldn't close the deal on the Nets as Joe Johnson's buzzer-beater capped Brooklyn's comeback on the road. "I mean, if you can find a better shooter than him right now, especially with the way he handles the ball -- and the light that he has, it's more than green, it's fluorescent -- you just hope that he misses." -- LeBron James, on Stephen Curry's 36-point performance Thursday night in Miami. 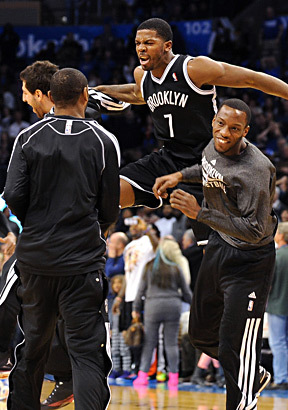 Mark D. Smith/USA TODAY Sports Joe Johnson makes his money at the buzzer. The Nets' closer finished off Brooklyn's comeback with a dagger in Oklahoma City. Thursday night's victory over the San Antonio Spurs was the New York Knicks' first win against a Western Conference team this season (they were 0-9). Entering Thursday night, they were the only NBA team without a win against the Western Conference. MVP: Jerryd Bayless and Ed Davis were big off the bench, but Zach Randolph was the consistent difference for Memphis. He dominated the Suns inside to the tune of 20 points and 15 rebounds. Defining moment: With five minutes left in the fourth, a madcap Memphis possession seemed to touch everyone on the floor before finding its way to Mike Miller for a layup. It was emblematic of a wild, chippy, back-and-forth game. That was ... a career best: On a poor shooting night for Phoenix, the Suns stayed in the game in large part thanks to Goran Dragic. With Eric Bledsoe missing, Dragic paced Phoenix with a career-high 33 points. MVP: Taking advantage of Milwaukee's less-than-stellar perimeter defense, Gordon Hayward led Utah's offense with an efficient scoring night. With 22 points on 8-of-16 shooting, Hayward was a constant threat the entire night. Turning point: Being lead by Utah's young-but-talented second unit, the Jazz broke the game open in the second quarter because of the combination of solid offensive penetration and overall defense. That was ... depressing: While Utah looked like a balanced offensive threat, Milwaukee was a one-sided team as it shot an awful 4-for-22 from beyond the arc. MVP: Thaddeus Young played a nearly flawless game on Thursday, posting 28 points, seven rebounds, six steals, four assists -- with zero turnovers -- to lead Philly to its third straight win. In his past nine outings, Young is averaging more than 22 points on 55 percent shooting. LVP: In 23 minutes, Ben McLemore, the drafts No. 7 overall pick, scored zero points on 0-for-5 shooting and added a pair of turnovers. The putative marksman is shooting less than 40 percent on the season. That was ... impressive: With the Kings trailing 94-79 a minute into the final period, Jimmer Fredette -- scoreless up to that point and averaging a meager 4.7 points on the season -- went off. In just less than 120 seconds, Fredette scored 10 unanswered points to narrow the Sixers' lead to five. It was a bizarre and incredible display that, ultimately, meant nothing. It was sports.